Below is a list of all the types of recycling we currently accept or download a leaflet of what you can recycle here. Please make sure you wash out empty containers before putting them in your bin, these should be put loose into the bin and not in black bags. Black* bin bags - even if they are full of recycling items. Please only use clear/see-through bags or put recycling items into your bin loose. *We have had lots of loads of recycling rejected by our recycling partners because they contain black bin bags and it is not possible to see what is in them. If loads are rejected the are sent to landfill, rather than being recycled. Please help us by putting recycling items into your blue bin loose, or use clear plastic bags. Please make sure your bin is at the kerbside from 6.30am on your collection day. To report a missed, lost or damaged bin, you can fill in one of the online forms below or telephone 0345 002 0022 by the end of the next working day after it was due to be emptied. If the crew have not reported an issue with your bin, we will return within three working days to empty it. Our waste services are jointly operated with Lichfield District Council and you will be taken to to their website to report these issues. If your blue bin is overflowing, you can order a second blue bin for free. Just call our waste services team on 0345 002 0022 or apply for an additional recycling bin online PLEASE NOTE: You will be taken to our partner Lichfield District Council’s website to apply. 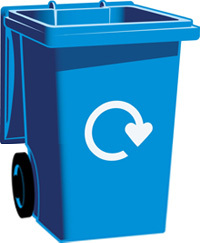 Alternatively, if you have too much recycling from time to time (such as at Christmas) and don't want an extra blue bin permanently, we will always take additional recycling if bagged in clear bags or carrier bags (so we can see they contain recycling items) and if placed next to your bin at the kerbside on your collection day. Our recycling goes to Biffa in Aldridge, where it is separated into various streams and then sent on to further locations for processing, which is detailed below. Tins and cans - Food tins are melted down to make new steel items: car parts, fridges, or even parts of bridges! Drinks cans are crushed, melted and made into ingots and sent to can makers. New drinks cans are in the shops again in only six weeks. Glass bottles and jars - Glass bottles and jars are washed, crushed, melted and moulded into new glass bottles. Some recycled glass is ground down and used to make roads. Plastics - Plastic bottles are cut into flakes, washed, dried and made into new products, such as signposts, garden furniture and wheelie bins! Paper and card - Paper is sent to a paper mill, pulped down and turned into new paper. Your newspaper could be back on the news-stand in as little as two weeks. Cardboard is flattened and folded and recycled to make new packaging, such as cereal boxes and washing powder boxes. It uses less energy and water than producing it from new. Paper and card breaks down slowly in landfill sites and produces harmful methane gas. To produce paper, trees are felled and valuable wildlife habitats are lost. Perhaps you are disabled or you struggle to move a heavy bin, why not speak to our team about an assisted collection? Either call us on 0345 002 0022 or fill in the book an assisted collection form on our partners Lichfield District Council's website.